Big Love, the long-awaited authorized biography of Lama Yeshe, provides an intimate portrait of not only FPMT’s founder, but of the earliest students that placed their trust in him. This excerpt is taken from the chapter chronicling Lama Yeshe’s activity during 1975 – a year marked by extensive activity throughout the world, including the first courses offered by Lama Yeshe and Lama Zopa Rinpoche in Australia. On Saka Dawa (the celebration of Buddha's birth, enlightenment and death), Lama Yeshe asked everyone at Chenrezig Institute to come outside after a Guru Puja for a meditation on the hill behind the gompa, May 25, 1975. Photo by Wendy Finster. Back at Bea Ribush’s Lama Yeshe made himself at home. He watched TV, played with Bea’s little poodle, Bobik, and did some cooking. He telephoned Tibetologist David Templeman and once again invited him to tea. Lama Yeshe gave two lectures in Brisbane before arriving at Chenrezig Institute in time for a month-long course, the second such meditation course held outside Nepal. One hundred and twenty people had enrolled for it. Anila Ann [Anila Ann McNeil] and her team had all but finished building the gompa on that steep empty land at Eudlo. The work had been done mainly by volunteers, qualified trades people turning up just in the nick of time and seemingly out of the blue. Ann had raised the money to pay for every plank and nail, though she was still living in the old shed. Once again caravans were hired for the lamas and Mummy Max [Ven. Max Mathews], who was not impressed. “I said to Lama, ‘Oh God, Lama, what karma you have! These camper trailers, no roads, no nothing.’ ‘It’s not for me, it’s for them,’ he told me,” recalled Max. Lama had a big vision for this center. In 1974 he had told them, “Think big! Think big!” That year, a horse called Think Big had won the world-famous Melbourne Cup. In 1975 Think Big won the cup again. No one had thought to place a bet. The course ran from May 5 to June 1. Mummy Max did not attend. Nor did Kathy Vichta, with whom Lama Yeshe spent some time cooking. “He showed me how to save time by squashing things with your hand instead of cutting them up. It worked just as well. He made a casserole one day by opening cans and just squashing the contents into bowls and saying mantras over them. Lama always said mantras while he cooked. He put so much physical energy into mundane stuff, like it was a really important part of his life,” said Kathy. Lama’s students presented him with an electric razor, despite the fact that he had only about twenty whiskers. He preferred the Tibetan method of plucking them out with a small engraved brass clip during quiet breakfasts with Mummy Max. 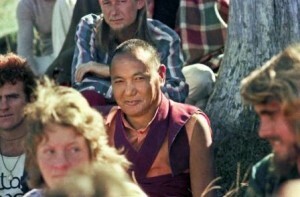 Cameras always appeared when Lama Yeshe was around. Everyone loved new photos of him – dancing on the beach, sitting in meditation, laughing, playing. With the idea of commissioning a statue of Lama, Max arranged for a series of shots taken just of his head, from every angle. He posed for these graciously and without any self-consciousness. Adèle Hulse is an Australian journalist, a long-time student of Lama Yeshe and Lama Zopa Rinpoche. Big Love is to be published by the Lama Yeshe Wisdom Archive in 2011.